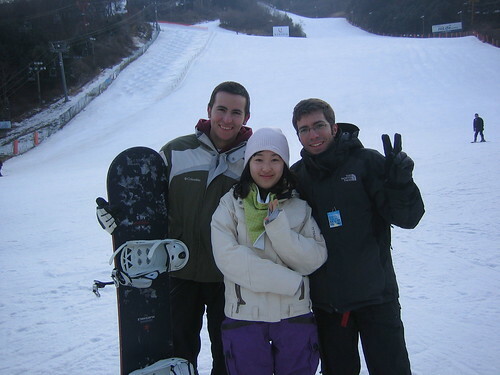 At the rental, with 상표 (Mark), Ju-Yun’s friend. From left to right, Ju-Yun, Alex, 은미 (Enice), and I.
Alex, 정은 (Ellen), and I. So yes, we had a lot of fun. Thanks a lot to Ju-Yun and her fiends! Also with Tanja and Annika, we went to visit the demilitarized zone between South Korea and North Korea. On the way from Seoul (the bus decoration is priceless:P). You can only vistit the DMZ with an organized tour. We took the whole package, which included a visit to the Third Tunnel of Aggression, Dora Observatory, Imgingak Park (where left my winter jacket! ), Dorasan Station, and (undoubtedly the most impressive place) the Joint Security Area, located in the village of Panmunjeom (판문점). The first spot was the Third tunnel of Aggression, dug by North Koreans with the intention of surprisingly attack Seoul and discovered by South Koreans in 1978. 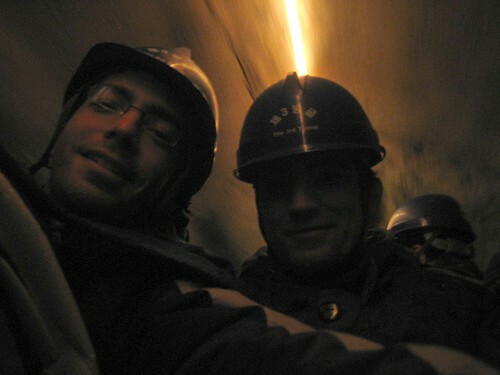 You have to wear a helmet while you are going down the tunnel, as it’s really narrow at some points. Going down the 3rd tunnel with Carlos. After that, we visited Dorasan Station, the closest train station to North Korea. Although the station is brand new (it was restored not long ago), you can’t see any passengers, since the only trains crossing this station to and from the north are those taking materials to the industrial complex in Gaeseong. 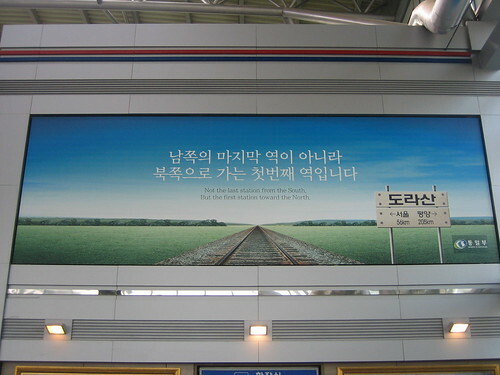 “Not the last station from the South, but the first station toward the North”. Hope some day this become true. Next to a train at Dorasan Station. With the security guard at the station. 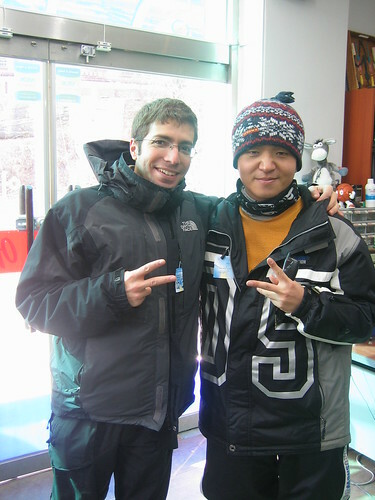 Also, we went to Imgingak Park, where we met some Korean schoolchildren who had come in a kind of organized trip. Schoolchildren on a school trip at Imgingak Park. 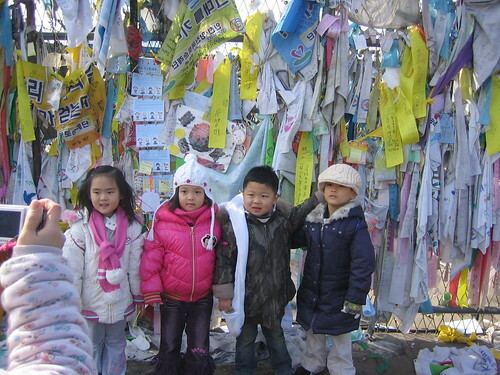 On the background there are messages that South Korean families leave for their relatives in the north with the hope that some day they can read them. From Dora Observatory you get a good view of North Korea. You can see some North Korean villages and the people living there. 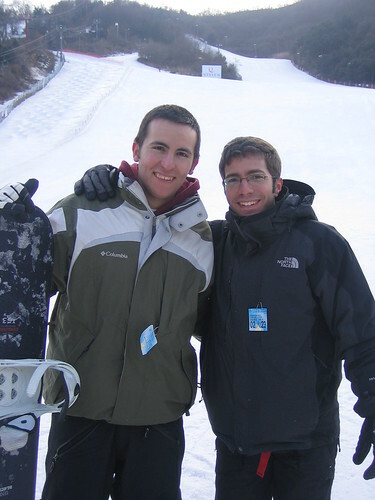 Unfortunately, at this place pictures are not allowed, so I can only show you a picture of ourselves. At Dora Observatory. 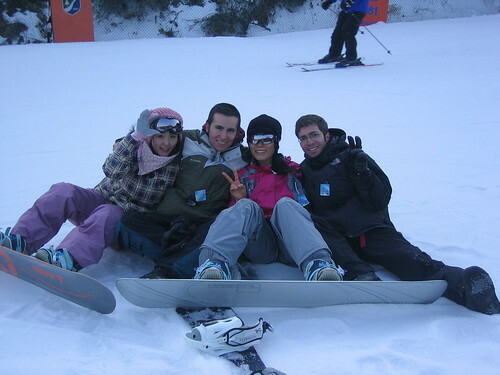 From left to right: Pablo, Annika, Manolo, Jairo, Alex, Carlos, and Ciro. 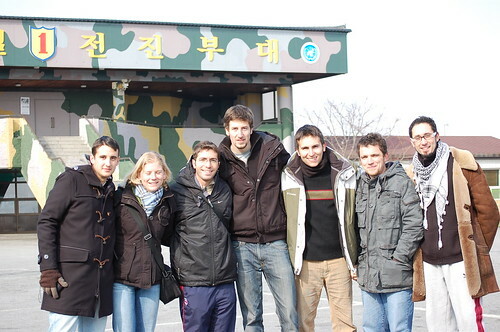 After the Dora Observatory came the most interesting part of the tour, the visit to the Joint Security Area, or JSA. We visited the place where the Poplar Tree Incident took place in 1976, almost initiating a war because of a tree. 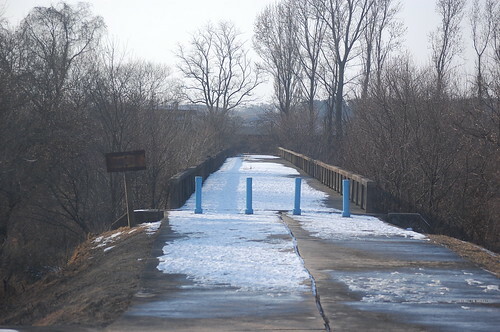 We also saw the bridge of no return, where prisioners of war were exchanged with the north (they call it like that because prisioners who crossed the bridge would never be allowed to return). 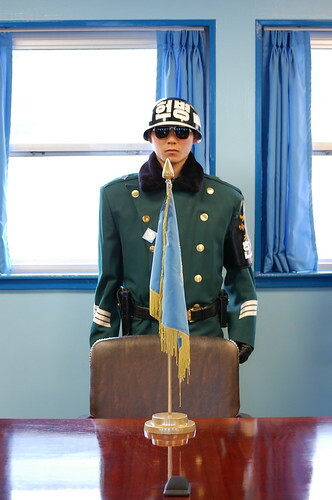 South Korean soldier in the room where the Korean Armistice Agreement was signed (literally on the border with North Korea). 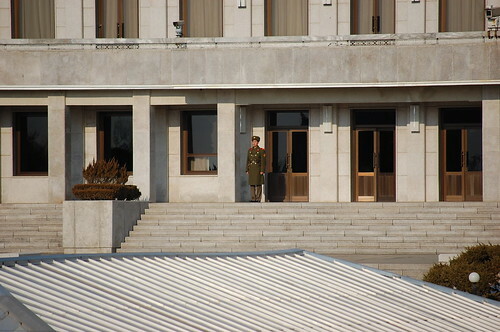 This was the only soldier watching the border on the North Korean side. 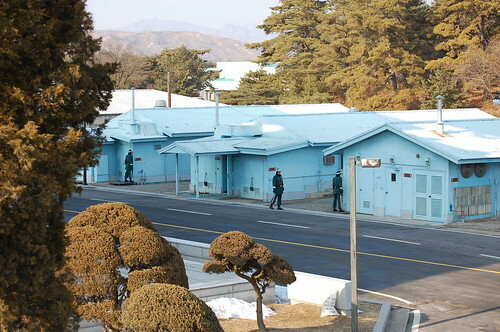 South Korean side of the JSA. 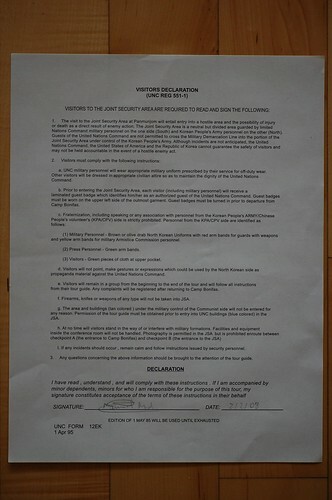 The document everybody has to sign before visiting the JSA. 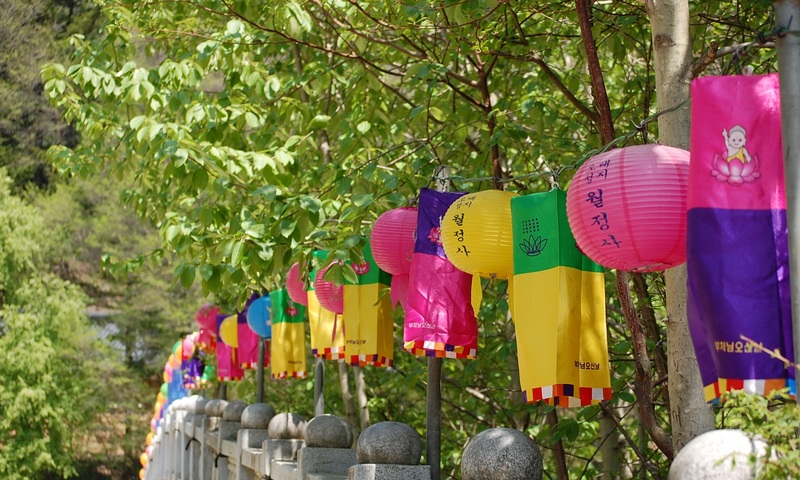 Overall, the tour is a bit expensive (110,000 KRW), but worth taking it if you visit South Korea. During the tour, rules are strict. You are supposed to dress formally (although I went with a dark training suit and they didn’t complain) and at some points you can’t take pictures.